1944, some island in the Pacific. 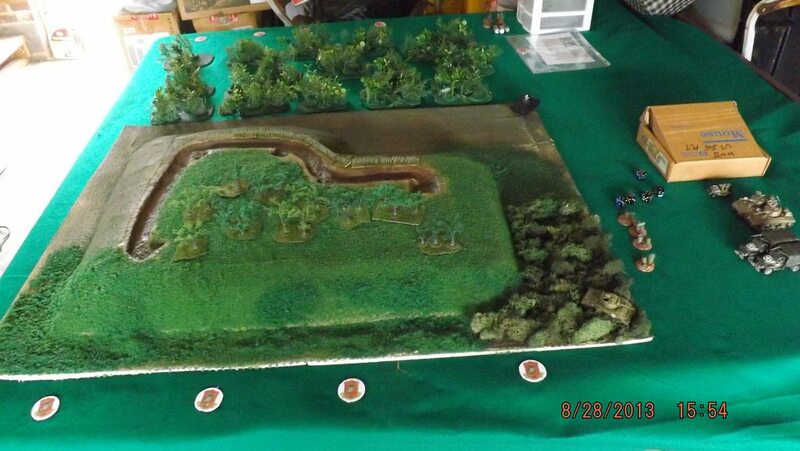 1st Platoon, B Company, 1st Battalion 19th Marines (completely fictional) is occupying a small hill about 2 miles from an airfield. It's been kind of a rest stop, a break from the action. 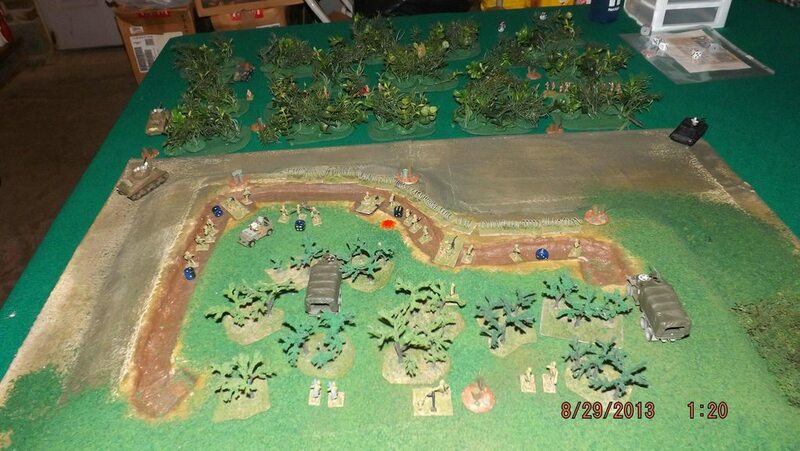 The platoon has dug some defensive positions and laid out some wire, but there's no mines available. But it's been quiet here and maybe the mines won't be necessary. The Company Commander stopped by last night and suggested that we need to start patrolling the jungle in front of us rather than just sitting around on our behinds. So 1st Squad will be going out this morning, mostly to see if they can find local vittles to add to the K rations. We may get a visit from a pair of Shermans later on today, too bringing mail and hot chow. 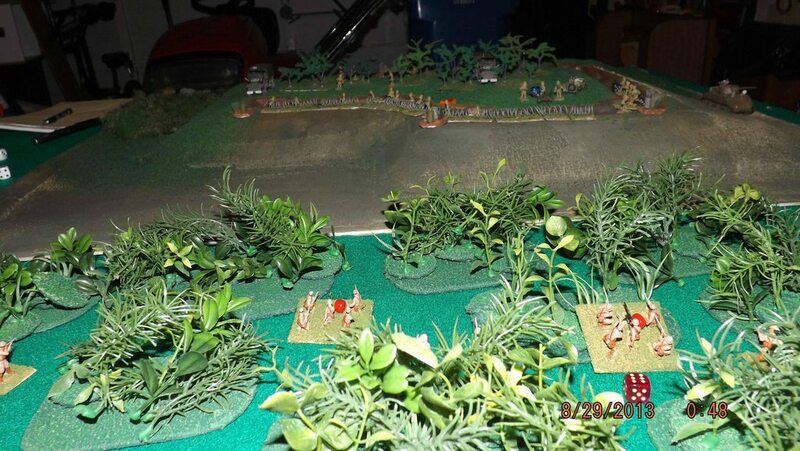 12th Platoon, 4th Company, 3rd Battalion, 357th Infantry Regiment is the lead element in a push to take the airfield. We're to take the high ground shown on the map to support the rest of the Regiment's attack. Our attack may get support from tanks if they can catch up, we're not delaying our attack to wait on them. 2 2.5 ton trucks, 2 crew, 1 HMG per. 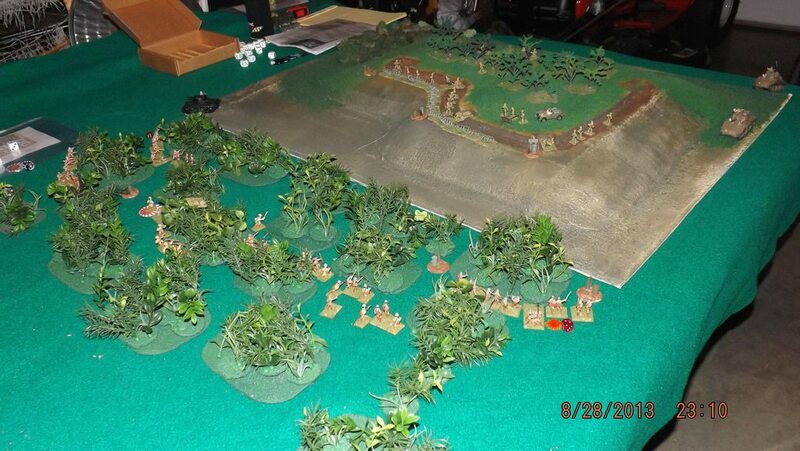 With the two M2 cal .50s on the trucks, the Marines kicked behind, eliminating 2 whole Japanese squads and reducing the platoon HQ to 1 HMG gunner, the platoon leader and sergeant. A badly written scenario that's I'm going to adjust and replay later today. I did get 30 phases in 6 turns played in 3 hours. The M2s on the trucks fire with 10d6 and reduce cover one level. The US squads fire with 7 at the range they had and the M1919s only 8. 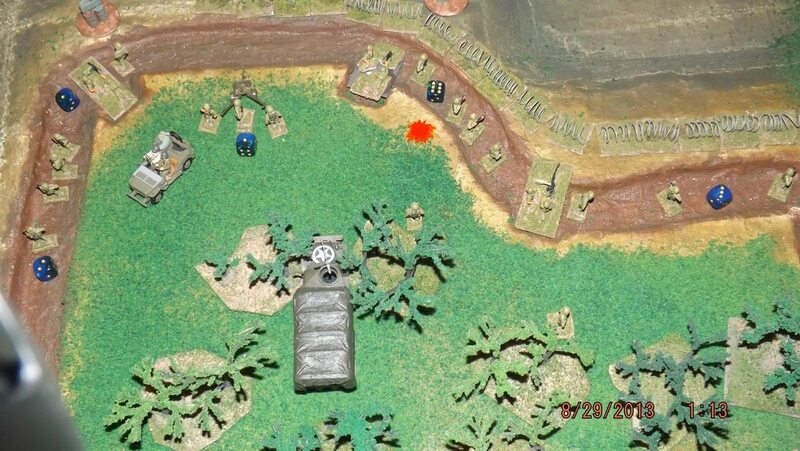 So if I'm playing the side correctly, I'm firing the M2s and leaving the squads and MMGs hunkered down in the trench. With no support lists, my estimation of the point per side is 18 for the Japanese and 25 for the Marines.